Many thanks to Shaul Cohen for the recommendation of Josh Begley’s Prison Map website via Emily Badger’s piece on ‘The Stunning Geography of Incarceration’. Josh Begley is a Masters student in Interactive Telecommunications at New York University, and the Prison Map website is part of a class project. He presents satellite images of American penitentiaries, rather than the ubiquitous statistics of mass incarceration, to highlight the sheer volume of these facilities and the resources which go into constructing places to ‘warehouse’ people. For Begley, the take-home message is about space, not only in relation to the distribution of prisons, and the housing of urban prisoners in rural locations, (and their counting in the census where they are incarcerated, not where they are from), but also in the spaces of imprisonment themselves, viewed from above. 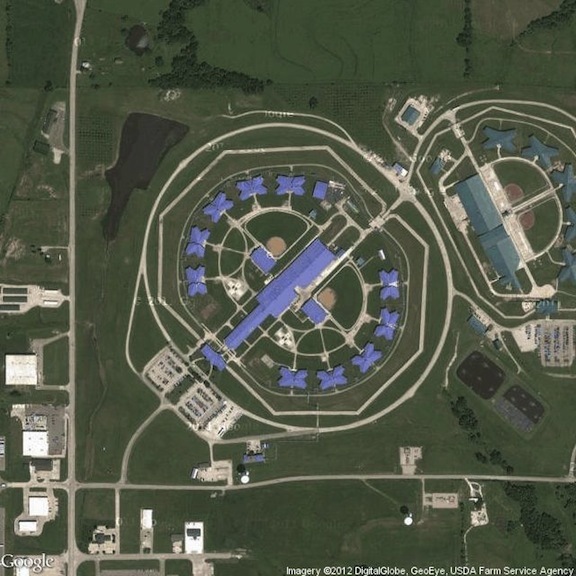 Satellite images of prisons have been used in research very recently, for example in Robert G Morris and John L Worrall’s forthcoming paper which considers the relationship between prison design and inmate misconduct. Using aerial views, they identify ‘telegraph pole’, (several rows of parallel multistory buildings, or pavilions, connected by one or two main corridors) and ‘campus’ (freestanding buildings surrounded by a large open space, often in the shape of a rectangle) penitentiaties in Texas and analyse the relationship between these two designs and inmate misconduct, using a random sample of 2,500 inmate disciplinary histories sourced from the Texas Department of Criminal Justice. They find a modest association between prison design and nonviolent misconduct, but acknowledge the drawbacks of the study, in terms of the reliance on officially reported midconduct data rather than prisoners’ insights, and the limitations of the satellite imagery in understanding the nature of prison spaces.